Rob Ramirez has been turning heads with his Designer Con line-up this year and this Foo Dog custom is an epic part of that list. Combining the form of the Foo Dog (Original design by Gummi Fetus), the line work of Rob’s ‘Day of the Dead’ works, and Swarovski elements, “Fire and Ice” delivers a stunning cultural collaboration. We absolutely LOVE the Aztec-like skeleton connecting the two opposing forces of fire and ice themselves. These guardians may be a more serious representation of the sugar skull line from InkVisuals, but these pieces are full of strength and beauty; an honorable tribute to the origins of many rich cultures. This pair is so powerful and grand! 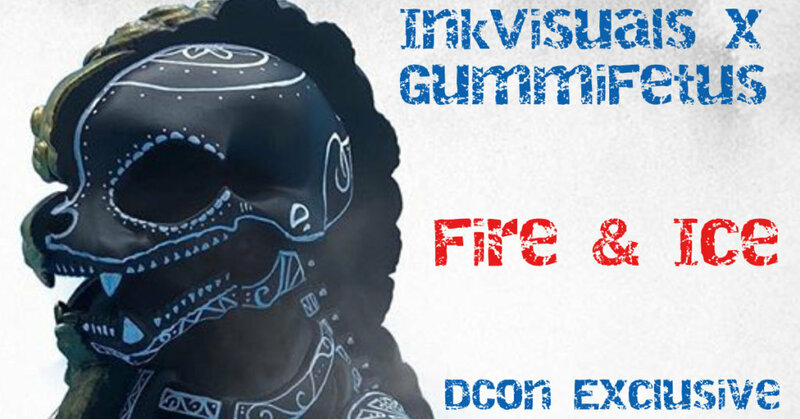 If you are able to, check out the InkVisuals booth at Designer Con in booth #2541 and follow them on instagram!